Leafy Offers Professional Landscape Construction, Installation, and Management for Residential Customers. We use an advanced scheduling software that ensures that your service requests and dates are always accurate. Have you ever made a request about an estimate or issue, received a “We’ll catch you next time”, and never hear from them again. When our technicians receive a request from our clients, it immediately gets forwarded to our office staff. Your requests then get noted accordingly. If for some reason we need to change your schedule, you will be notified by our friendly staff. You can also login to your account online to make service requests, see upcoming service dates, and view and update billing information. We strive to be your one solution to all of your landscaping needs. If there is something we do not do, we have a solution or we will find one. We feel it is important when you call, we answer. Our friendly and helpful office staff are alway there to assist and answer all your questions. We promise to respond to your requests within twenty-four hours, seek a solution, and execute a resolution. We understand the importance of training. Our mowing technicians encounter continuous training ensuring proper use of equipment not only to result in a great service, but also to protect you from damage to your lawn, plant material, and property. No more beveling, rutting, scalping, or pivoting on your lawn. We understand the importance of consistency in both staff and quality. High turnover rates are something we don’t want either. That’s why we are very selective with new hires, spend time with them one on one, and pay top wages in our market. We understand pets are part of the family and we strive to keep them safe and out of harm’s way by providing a checklist for each property that includes ensuring all gates and doors are completely shut, keeping your animals safe. Tired of contracts? 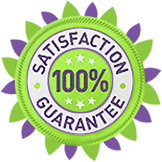 We guarantee our customers will be 100% satisfied with our work so there is no need for contracts keeping you locked into something you are not happy with. To produce a service environment with people who care, communicate, respond, and respect you and your property; that produces products WE are proud of; We must charge more than those who DON’T. We put a lot of pride in our trucks and equipment so that we arrive on time and service your property efficiently and effectively. Our staff of mechanics service our equipment weekly to ensure that we deliver. We have put a lot of thought into our equipment with your property in mind. A combination of proper equipment and training helps result in a healthier landscapes and happier clients.